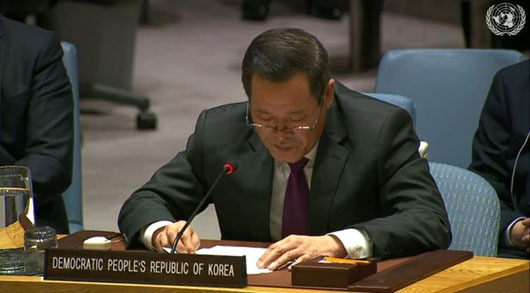 North Korean Ambassador to the United Nations Kim Song criticized what he called Israel’s illegal occupation of Palestine and, in an apparent shot at the U.S., blasted some permanent members of the UN Security Council for what he called a “double standard” attitude on the Israel-Palestinian issue. Song delivered the comments in an unusual appearance at a Jan. 22 meeting of the Security Council. The North Korean ambassador also said that Pyongyang stands in solidarity with Syrians in their efforts to regain the occupied Syrian Golan. Meanwhile, North Korean leader Kim Jong-Un said he was happy to receive what he called a “great” letter from U.S. President Donald Trump, the North’s state media reported on Jan. 24. “We trust President Trump’s positive way of thinking and will wait with patience and good faith,” Kim was quoted as saying. The leader received the letter after being briefed by a North Korean delegation led by Kim Yong-Chol, vice-chairman of the Central Committee of the Workers’ Party, which met with Trump and U.S. Secretary of State Mike Pompeo recently in Washington, D.C., the North’s Korean Central News Agency reported. Pompeo stated that “I believe at the end of February we’ll have another good marker along the way,” referring to the anticipated second summit between Kim and Trump. Pompeo’s remarks came after officials from the U.S. and North Korea held working-level talks in Sweden. Pompeo said “a little bit more progress” was made at the meeting between U.S. Special Representative for North Korea Stephen Biegun and North Korea’s Vice Foreign Minister Choe Son-Hui. “They were able to discuss some of the complicated issues towards achieving what the two leaders laid out back last June in Singapore,” Pompeo said. Park Won-Gon, a professor at Handong Global University, told the Korea Times that it appears all options have been laid on the table, including verifying the dismantlement of the North’s Punggye-ri and Tongchang-ri sites and freezing its nuclear activities. The North could also dismantle its Yongbyon nuclear facility if the U.S. took the corresponding measure the Kim Jong-Un regime seeks, which is easing sanctions, Park said. The U.S. has maintained that sanctions will remain intact. “The countries could work out a deal such as North Korea taking these denuclearization steps and the U.S. allowing tours to Mount Geumgang to be resumed first,” Park said. Pyongyang has been calling for the resumption of Mount Geumgang tours and the operation of the Gaeseong Industrial Complex as corresponding measures for its denuclearization steps.